I'm sort of protective of my Sundays. It's like...the final day to get stuff done before the craziness of the week begins. While I try to start laundry on Saturday and get as much done as possible, I always seem to be folding up the last load while watching The Walking Dead. And I know I should check backpacks on Friday as soon as they're strewn across living room chairs, but instead I choose to pretend that I don't see them. Which led to an unfortunate missed-birthday-party incident a year or two ago. Who sends home invites on Friday for a Saturday party, anyway!? And my mom and sisters know way better than to ask me to drive up to visit on a Sunday. I mean, an hour to two driving each way (depending on who we're going to see), plus time to actually catch-up? It's not happenin' on a Sunday. Because I will spend the whole day obsessively running what needs to be done through my head. And therefore I won't enjoy myself. I'll be on edge. Who wants to hang out with somebody like that? So, you can imagine my chagrin when I found out that my husband's "holiday party" for work was on a Sunday night. From 5:00-8:00. In the evening. On a Sunday. What in the higgity-hizeck is that all about!? Can you imagine what's going on in my head for the entire weekend? I know, I know...chill out, right? Deep breaths. You will get through this. 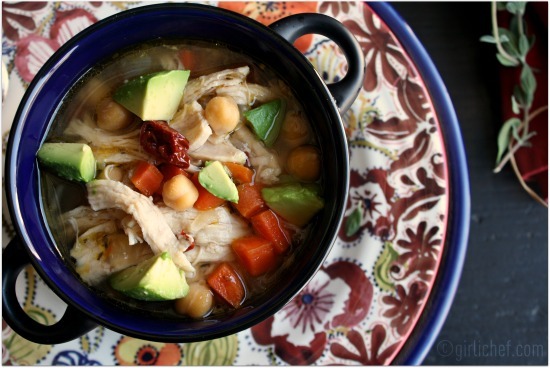 So a comforting bowl of soup with a warm, smoky broth, tender shreds of chicken, and earthy, mealy chickpeas with a hint of lime and some creamy avocado...well, it was just the thing I needed to guide me through this weekend. It soothed the obsessive, organized, control-freak side of me for the rest of the day. Isn't it amazing what a good bowl of soup can do? Oh, and p.s... my Sunday "thing"? It's only during the school year. Summer vacation brings on a wild rebellion in which I can forget what day it actually is. Sunday Shmunday. 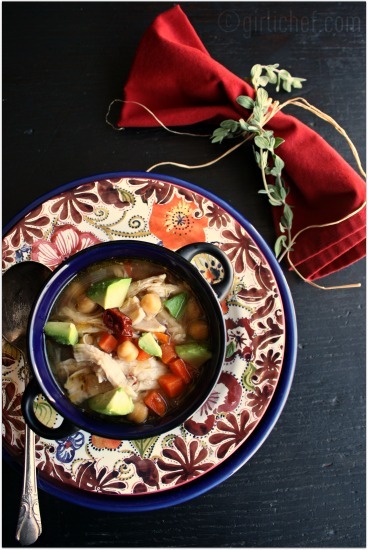 Garbanzo beans and chunks of vegetables in a smoky broth. Place chicken and broth in a pot with the herbs and bring to a boil. Lower heat and simmer, partially covered for ~13 minutes, or until breast reaches 165° F.
Let breast cool in the broth for a bit, and when cool enough to handle, remove. Remove the skin and pull the meat from the bones. Shred with you fingers and set aside. Skim any excess fat from broth. Set a Dutch oven or soup pot over medium heat and add oil. Sauté onions and carrots, stirring occasionally until onions start to turn golden, ~7 minutes. Add garlic and cook for another minute. Add garbanzos, epazote, and reserved broth. Cover partially and simmer for ~30 minutes. Season to taste with salt and pepper. Remove epazote sprig. Stir in reserved chicken and the chipotles with adobo sauce just before serving and let cook for just a minute or two. 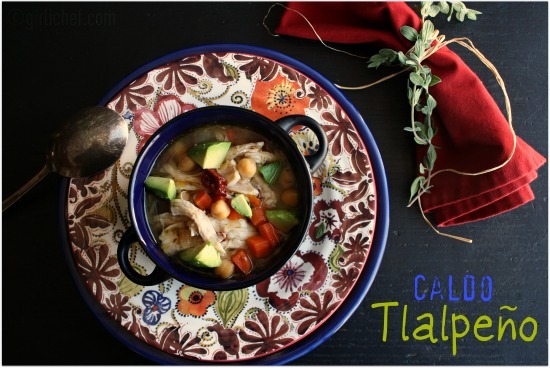 Ladle soup into bowls and divide some chunks of avocado among bowls. Pass lime wedges for squeezing.